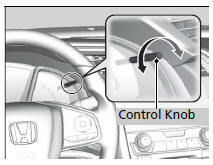 When the parking lights are turned on and the ignition switch is in ON *1, you can use the brightness control knob to adjust instrument panel brightness. You will hear a beep when the brightness reaches minimum or maximum. Several seconds after adjusting the brightness, you will be returned to the previous screen. The brightness level is shown on the display while you are adjusting it. 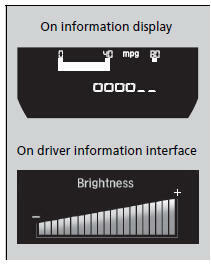 Pressing the (TRIP) knob or the (display/ information) button* switches the display.